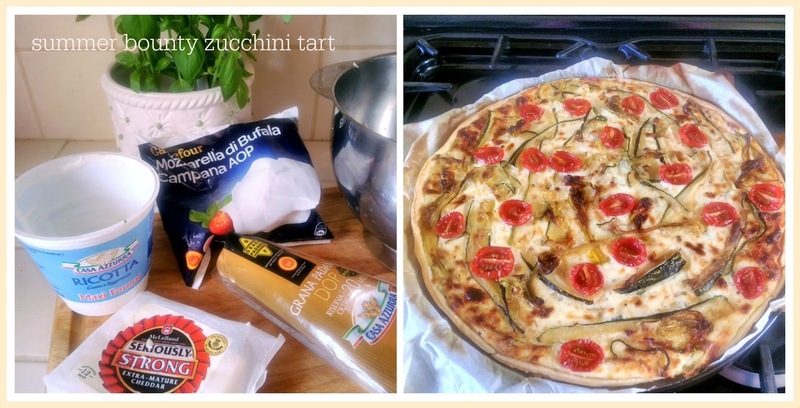 What to do with courgettes is the title of one of my boards on Pinterest. Created as a place to keep track of amazing recipes it never fails to inspire me when faced with the annual glut of courgettes from my potager. During the last week, or so, not only have I pinned even more delicious dishes to make but now friends of mine are sending me pins that they have found to add to the board. After I begged nay pleaded asked nicely, my dear friend H shared her own recipe for a chocolate zucchini cake which I had to try. A classic bake indeed, then I kind of went off piste and tweaked the glaze, exchanging the orange icing drizzle for a decadent ghirardelli dark chocolate chip ganache. Talk about death by chocolate! One of my summer "traditions" is to make some sort of pickle/relish/chutney with produce from my garden and so, on what was probably the hottest day of summer 2016, I selected two new recipes from my board to help me deal with these monsters. Both were simple (if a little time consuming) to make and they taste exceedingly good. I'll be taking a couple of jars to give to my sister in the UK when we get together for afternoon tea very soon. Do you ever take a look inside your fridge and find loads of dairy products just waiting to be eaten before their "use by" date? A few days ago I uncovered a bag of mozzarella, a pack of strong English cheddar and a tub of ricotta lurking in mine. A quick search of my WTDWC board revealed Summer Bounty Zucchini Tart which sounded just the ticket so I defrosted a pack of pâte feuilletée and made this. Clicking on any of the highlighted links will take you either to my WTDWC board or to the websites of the very generous food bloggers who provided these fabulous dishes for everyone to share. That tart looks so good Maggie! It's a good thing that it's time for bed, or I might start to work on the half of a GIANT zucchini that waits in the crisper of the fridge! I will be back in the morning to enjoy the rest of the mosaics on this great link-up. Courgettes are a favorite around here, and I'm always looking for ways to use them. H's cake looks delicious with your tweaks! I've been making zucchini patties and we're enjoying those. I'll be checking out your Pinterest board. I've been meaning to ask if that's a Burleigh ware cup on your header. I discovered Burleigh ware in England and really love the look. Thank you again for hosting Mosaic Monday! Bonne semaine! Your photos look so delicious Maggie. 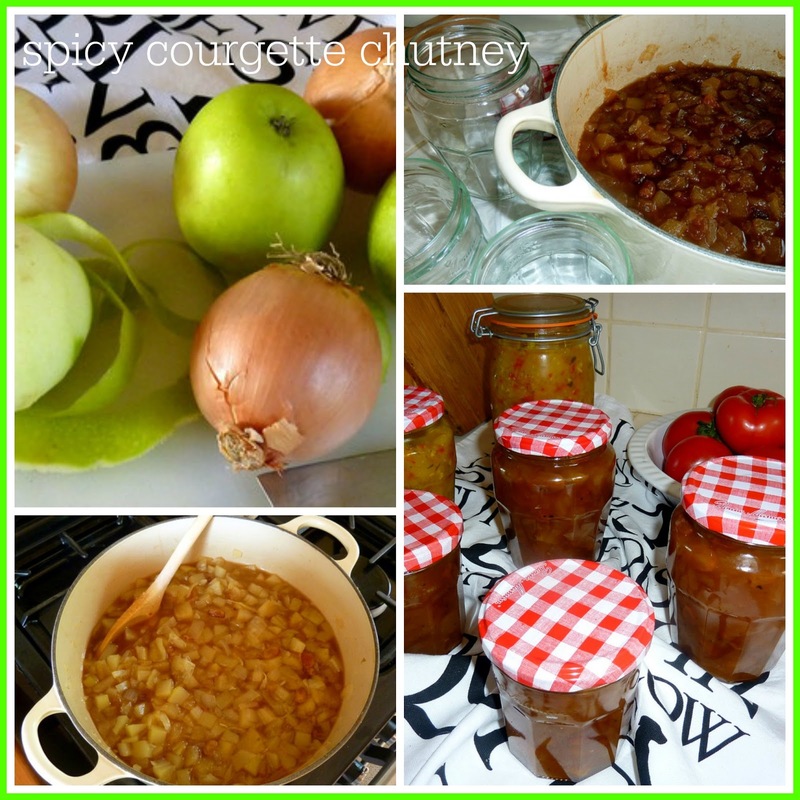 The gourgette chutney must be fabulous! I'm off to look at your board straight away. 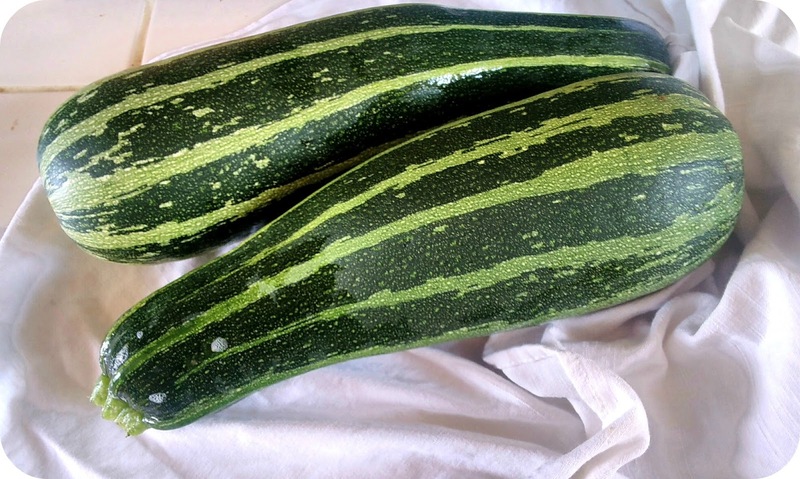 I have several enormous courgettes to use up! 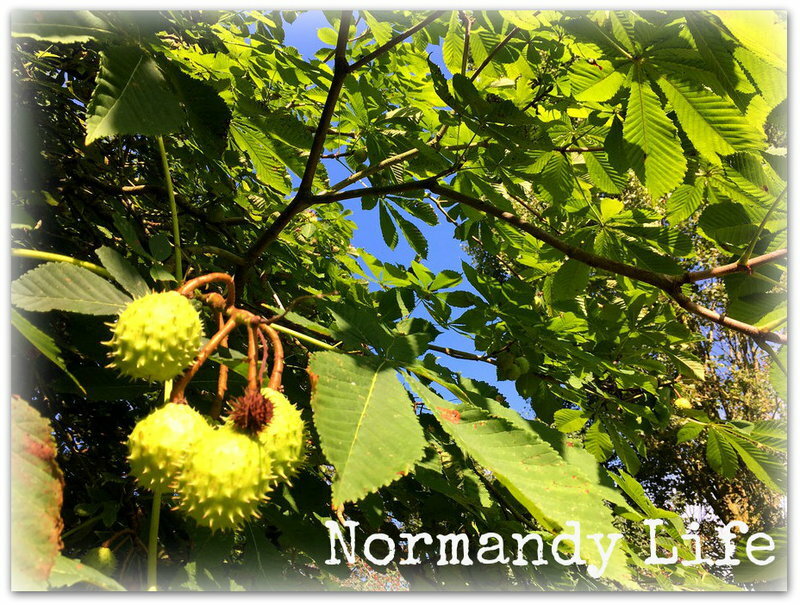 I'm here for the first time and I'm so very glad to enjoy our so beautiful link-up party which to begin my new week with, thank you ! Oh my heavens! Everything looks delicious and you say it has zucchini in it? I know that I faked my family out one year by baking lemon glazed cookies that had grated zucchini in them. 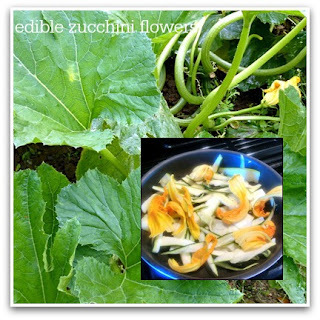 Alas, no zucchinis in my world this year or I would be trying that amazing looking tart. Now let me see if I remember how to link. It has been so long since I joined in on the fun! Thank you for taking on Mosaic Monday. I now have your button and will be visiting if not always participating. Hello Maggie, YUM, chocolate zucchini cake sounds interesting. The tart looks delicious. I would love to try the relish. Thanks for hosting MM. Happy Monday, enjoy your new week! You've been ambitious with cooking and baking and everything looks delicious. I'm hoping with cooler weather I'll be inspired to be creative in the kitchen. I signed up for a one day pie baking course and hope to learn something new. Now I know! lol And at the farmer's mkt last week, I saw yellow zucchini...looked wonderful! Hugs! I'll be checking out your pinterest boards -- dangerous! Ha! I always seem to buy too much when I go to the Farmer's Market. But everything looks so good and fresh. 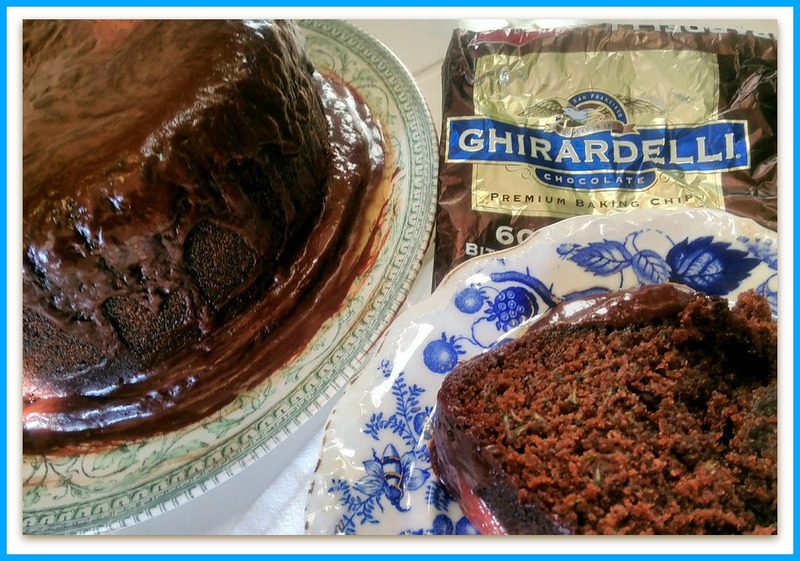 Death by Chocolate and zucchini -- who knew???!!!! Relish and chutney -- where to start first? I'd start with the tart ...!!!!! Thanks for hosting and have a lovely week. The summer bounty tart looks like it will be delicious. Wow! Way to go! I am so tired of cucumbers. Your lovely dish at the bottom looks scrumptious! What is it about zucchini in the fall? It seems to be so plentiful if the rains have been around. Some good ideas for cooking. I've stopped looking at recipes. I have food allergies plus other digestive issues and basically, if it's delicious, I can't eat it! I make sweet pickle zucchini relish - and bread and butter pickles from them too. The big giant ones work well - cut in quarters - scoop out the seeds and slice for pickles - chop for relish. So many good things to make. The chocolate cake looks so good. The husband brought in the zucchini tonight. One normal size--whatever that is--and one HUGE. I will shred it up and make something. Bread. Maybe. Macbeth ranks high on my list of Shakespeare fav's too. No other woman so cold as his lady.